After the blasting winds and rain of Sandy, the streets are wet and plastered with green, orange and brown leaves. On all hallow’s eve, the kids came tromping along — one was dressed as a slice of pizza, which was the only costume her parents could handle after her other choices, a flying pony or a finger — and our neighbors Sherlock Holmes and a leather clad cowgirl were bailing out buckets of candy from their never-ending supply. Fun times! Meanwhile, much inspired by Rudy the Elder’s recent foray into self-publishing, I decided to take a crack on putting together my own ebook. 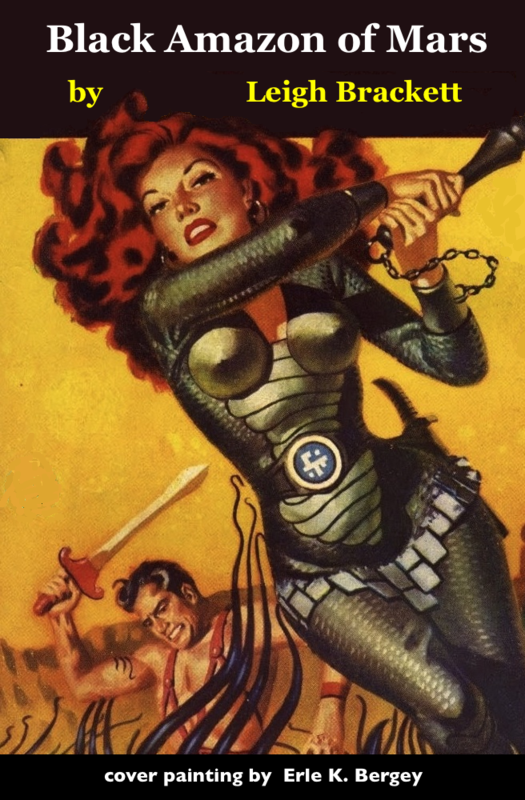 Just for test purposes I grabbed the first out-of-copyright PDF on my laptop, which happened to be Black Amazon of Mars, by Leigh Bracket, and began to crank it through Calibre. The actual components and .xml massaging turned out to be rather finicky, but I finally got the general hang of it. So, enjoy the first ebook from TIMEBRANE Books, and let me know what you think! Free EPUB edition: Black Amazon of Mars, by Leigh Bracket. Happy Walpargus-nacht, Samhain, All Souls night, Halloween, Witches Sabbath, or whatever it is you want to celebrate on this velvet black autumn night!